The Dayak /ˈdaɪ.ək/ or Dyak or Dayuh are the native people of Borneo. 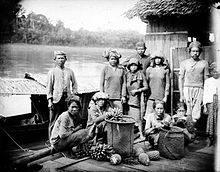 It is a loose term for over 200 riverine and hill-dwelling ethnic subgroups, located principally in the central and southern interior of Borneo, each with its own dialect, customs, laws, territory and culture, although common distinguishing traits are readily identifiable. Dayak languages are categorised as part of the Austronesian languages in Asia. The Dayak were animist in belief; however, many converted to Islam and since the 19th century there has been mass conversion to Christianity. Today most Dayak still follow their ancient animistic traditions, but often state to belong to one of the 6 recognized religions in Indonesia. The Dayak sociolinguistic map as described by Tjilik Riwut in 1954, which divided the Dayak groups into Ngaju, Apu Kayan, Iban, Klemantan, Murut, Punan and Ot Danum. The independent state of Nansarunai, established by the Ma'anyan Dayaks prior to the 12th century, flourished in southern Kalimantan. The kingdom suffered two major attacks from the Majapahit forces that caused the decline and fall of the kingdom by the year 1389; the attacks are known as Nansarunai Usak Jawa (meaning "the destruction of the Nansarunai by the Javanese") in the oral accounts of the Ma'anyan people. These attacks contributed to the migration of the Ma'anyans to the Central and South Borneo region. In 1838, British adventurer James Brooke arrived to find the Sultan of Brunei fending off rebellion from warlike inland tribes. Sarawak was in chaos. Brooke put down the rebellion, and was made Governor of Sarawak in 1841, with the title of Rajah. 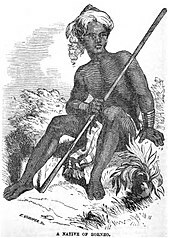 Brooke pacified the natives, including the Dayaks, who became some of his most loyal followers. He suppressed headhunting and piracy. Brooke's most famous Iban enemy was Libau "Rentap"; Brooke led three expeditions against him and finally defeated him at Sadok Hill. Brooke had many Dayaks in his forces at this battle, and famously said "Only Dayaks can kill Dayaks. So he deployed Dayaks to kill Dayaks." Sharif Mashor, a Melanau from Mukah, was another enemy of Brooke. Coastal populations in Borneo are largely Muslim in belief, however these groups (Tidung, Banjarese, Bulungan, Paser, Kutainese, Bakumpai) are generally considered to be Malayised and Islamised native of Borneo and heavily amalgated by the Malay people, culture and sultanate system. These groups identified themselves as Melayu or Malay subgroup due to the closer cultural identity to the Malay people, compared from the Dayak umbrella classification, as the latter are traditionally associated for their pagan belief and tribal lifestyle. The Dayak people classification are largely limited among the ethnic groups traditionally concentrated in southern and interior Sarawak and Kalimantan. 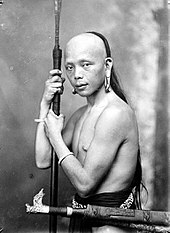 Other native groups in dwelling in northern Sarawak, parts of Brunei and Sabah, chiefly the Bisayah, Orang Ulu, Kadazandusun, Melanau, Rungus and dozens of smaller group were categorised under a separate classification apart from the Dayaks due to the difference in culture and history. Dayaks do not speak just one language, even if just those on the island of Borneo (Kalimantan) are considered. Their indigenous languages belong in the general classification of Malayo-Polynesian languages and to diverse groups of Bornean and Sabahan languages (including Land Dayak), and the Ibanic languages of the Malayic branch. Most Dayaks today are bilingual, in addition to their native language, they are well-versed in Malay or Indonesian, depending on their country of origin. Dayak chief as seen holding a spear and a Klebit Bok shield. 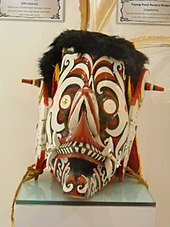 The Dayak indigenous religion has been given the name Kaharingan, and may be said to be a form of animism. The name was coined by Tjilik Riwut in 1944 during his tenure as a Dutch colonial Resident in Sampit, Dutch East Indies. In 1945, during the Japanese Occupation, the Japanese referred Kaharingan as the religion of the Dayak people. During the New Order in the Suharto regime in 1980, the Kaharingan is registered as a form of Hinduism in Indonesia, as the Indonesian state only recognises 6 forms of religion i.e. Islam, Protestantism, Roman Catholicism, Hinduism, Buddhism and Confucianism respectively. The integration of Kaharingan with Hinduism is not due to the similarities in the theological system, but due to the fact that Kaharingan is the oldest belief in Kalimantan. 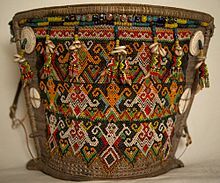 Unlike the development in Indonesian Kalimantan, the Kaharingan is not recognised as a religion both in Malaysian Borneo and Brunei, thus the traditional Dayak belief system is known as a form of folk animism or pagan belief on the other side of the Indonesian border. Muslim Dayaks have generally retained their original identity and kept various customary practices consistent with their religion. Many Christian Dayak has changed their name to European name but some minority still maintain their ancestors traditional name. Since Iban has been converted to Christian, some of them abandoned their ancestors belief such as 'Miring' or celebrate 'Gawai Antu' and many celebrate only Christian festivals. 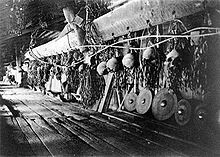 A Dayak Longhouse, known as Rumah Betang in Indonesia or Rumah Panjang in Malaysia, the traditional dwelling of many Dayak Tribes. Original watercolour painting by Carl Schwaner, 1853. 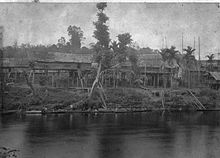 Dayak war party in proas and canoes fought a battle with Murray Maxwell following the wreck of HMS Alceste. Two highly decorated Iban Dayak soldiers from Sarawak in Malaysia are Temenggung Datuk Kanang anak Langkau and Sgt Ngaliguh (both awarded Seri Pahlawan Gagah Perkasa) and Awang anak Raweng of Skrang (awarded a George Cross). So far, only one Dayak has reached the rank of a general in the Malaysian military: Brigadier-General Stephen Mundaw in the Malaysian Army, who was promoted on 1 November 2010. The Dayak soldiers or trackers are regarded as equivalent in bravery to the Royal Scots or the Gurkha soldiers. While in Indonesia, Tjilik Riwut was remembered as he led the first team of Indonesian National Armed Forces performing a skydiving act on 17 October 1947. The team was known as MN 1001, with 17 October was celebrated annually as a special day for the Indonesian Air Force Paskhas, which traces its origins to that pioneer paratroop operation in Borneo. Organised Dayak political representation in the Indonesian State first appeared during the Dutch administration, in the form of the Dayak Unity Party (Parti Persatuan Dayak) in the 1930s and 1940s. The feudal Sultanates of Kutai, Banjar and Pontianak figured prominently prior to the rise of the Dutch colonial rule. Political circumstances aside, the Dayaks in the Indonesian side actively organised under various associations beginning with the Dayak League (Sarekat Dayak) established in 1919 in Banjarmasin, to the Partai Dayak in the 1940s, which serves as an early Pan-Dayakism in Indonesia and to the present day, where Dayaks occupy key positions in government. The violent massacre of the Malay sultans, local rulers, intellectuals and politicians by the Imperial Japanese Army during the Pontianak incidents of 1943–1944 in West Borneo (present-day West Kalimantan province) created a social opportunity for the Dayak people in the West Kalimantan political and administrative system during the Orde Lama era in the Sukarno regime, as a generation of predominantly Malay administrator in West Borneo was lost during the genocide perpetrated by the Japanese. The Dayak ruling elite were mostly left unscratched due to the fact that they were then mainly located in the hinterland and because the Japanese were not interested, thus giving an advantage for the Dayak leaders to fill the administrative and political position after the Indonesian independence. The party was later disbanded after an order by the then-president Sukarno that prohibited an ethnic-based party. The members of the party were then continued their careers in other political parties. Oevaang Oerey joined the Indonesian Party (Partai Indonesia), whilst some others joined the Catholic Party (Partai Katolik). Among the most prominent Indonesian Dayak politician is Tjilik Riwut, a member of Central Indonesian National Committee, he was honourned as the National Hero of Indonesia (Gelar Pahlawan Nasional Indonesia) in 1998 for his major contribution during the Indonesian National Revolution. He had served as the Central Kalimantan Governor between 1958 and 1967. While in 1960, Oevaang Oeray was appointed as the 3rd Governor of West Kalimantan, becoming the first governor of Dayak origin in the province. He held the office until 1966. He is also known as one of the founding fathers of Dayak Unity Party in 1945 and had been actively assisting the Brunei Revolt in 1962 during the height of Indonesia–Malaysia confrontation. 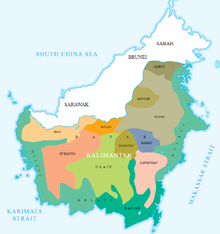 Under Indonesia, Kalimantan is now divided into five self-autonomous provinces i.e. North, West, East, South and Central Kalimantan. Under Indonesia's transmigration programme, which was initiated by the Dutch in 1905, settlers from densely populated Java and Madura were encouraged to settle in the Indonesian provinces of Borneo. The large-scale transmigration projects continued following Indonesian independence, causing social strains. In 2001 the Indonesian government ended the transmigration of Javanese settlement of Indonesian Borneo. During the killings of 1965–66 Dayaks killed up to 5,000 Chinese and forced survivors to flee to the coast and camps. Starvation killed thousands of Chinese children who were under eight years old. The Chinese refused to fight back, since they considered themselves "a guest on other people's land" with the intention of trading only. 75,000 of the Chinese who survived were displaced, fleeing to camps where they were detained on coastal cities. The Dayak leaders were interested in cleansing the entire area of ethnic Chinese. In Pontianak, 25,000 Chinese living in dirty, filthy conditions were stranded. They had to take baths in mud. The massacres are considered a "dark chapter in recent Dayak history". From 1996 to 2003 there were violent attacks on Indonesian Madurese settlers, including executions of Madurese transmigrant communities. The violence included the 1999 Sambas riots and the Sampit conflict in 2001 in which more than 500 were killed in that year. Order was restored by the Indonesian Military. Dayaks political representation in Sarawak compare very poorly with their organised brethren in the Indonesian side of Borneo, partly due to the personal fiefdom that was the Brooke Rajah dominion, and possibly to the pattern of their historical migrations from the Indonesian part to the then pristine Rajang Basin. Reconstituted into British crown colony after the end of Japanese occupation in World War II, Sarawak obtained independence from the British on 22 July 1963, alongside Sabah (North Borneo) on 31 August 1963, and would join the Federation of Malaya and Singapore to form the Federation of Malaysia on 16 September 1963 under the belief of being equal partners in the "marriage" as per the 18 and 20-point agreements and the Malaysia Agreement of 1963. Dayak political activism in Sarawak had its roots in the Sarawak National Party (SNAP) and Parti Pesaka Anak Sarawak (PESAKA) during post-independence construction in the 1960s. These parties shaped to a certain extent Dayak politics in the state, although never enjoying the real privileges and benefits of Chief Ministerial power relative to its large electorate due to their own political disunity with some Dayaks joining various political parties instead of consolidating inside one single political party. It appears that this political disunity is caused by the fact of inter-ethnic and intra-ethnic warfares among the various Dayaks ethnic groups in their past history that led to political rivalries at the loss of the whole Dayak people's power. The Dayaks need to forget their past, close ranks to unite under one umbrella party and prioritize the whole Dayak interests above all personal interests. The first Sarawak Chief Minister was Datuk Stephen Kalong Ningkan, who was removed as the chief minister in 1966 after court proceedings and amendments to both Sarawak state constitution and Malaysian federal constitution due to some disagreements with Malaya with regards to the 18-point Agreement as conditions for the formation of Malaysia. Datuk Penghulu Tawi Sli was appointed as the second Sarawak chief minister who was a soft-spoken seat-warmer fellow and then replaced by Tuanku Abdul Rahman Ya'kub (a Melanau Muslim) as the third Sarawak chief minister in 1970 who in turn was succeeded by Abdul Taib Mahmud (a Melanau Muslim) in 1981 as fourth Sarawak chief minister. After Taib Mahmud resigned on 28 February 2014 to become the next Sarawak's governor, he appointed his brother-in-law, Adenan Satem, as the next Sarawak Chief Minister, who has in turn been succeeded by Abang Johari Openg in 2017. SNAP won 18 seats (with 42.70% popular vote) out of total 48 seats in Sarawak state election, 1974 while the remaining 30 seats won by Sarawak National Front. This resulted in the first Iban becoming the Opposition Leader in teh Malaysian Parliment i.e. Datuk Sri Edmund Langgu being the leading Iban MP from SNAP with the SNAP president James Wong being detained under the Internal Security Act (ISA). PBDS (Parti Bansa Dayak Sarawak), a breakaway of SNAP in Sarawak state election in 1987 won 15 seats while its partner Permas only won 5 seats. Overall, the Sarawak National Front won 28 constituencies with PBB 14; SUPP 11 and SNAP 3. In both cases, SNAP and PBDS (now both party are defunct) had joined the Malaysian National Front as the ruling coalition. ^ "East & Southeast Asia: Brunei". The World Factbook. Central Intelligence Agency. Retrieved 3 December 2016. ^ "Report for ISO 639 code: day". Ethnologue: Countries of the World. Archived from the original on 1 October 2007. ^ Chalmers, Ian (2006). "The Dynamics of Conversion: the Islamisation of the Dayak peoples of Central Kalimantan" (PDF). Asian Studies Association of Australia. Archived from the original (PDF) on 7 March 2014. Retrieved 3 December 2016. ^ Belford, Aubrey (25 September 2011). "Borneo Tribe Practices Its Own Kind of Hinduism". The New York Times. ISSN 0362-4331. Retrieved 18 April 2019. ^ Osup, Chemaline Anak (2006). "Puisi Rakyat Iban - Satu Analisis: Bentuk Dan Fungsi" [Iban Folk Poetry - An Analysis: Form and Function] (PDF). University of Science, Malaysia (in Indonesian). ^ "Use of Papan Turai by Iban". Ibanology (in Indonesian). 29 May 2013. Retrieved 3 December 2016. ^ "Tetek Tatum Asal Mula Suku Daya". Blog Informasi Dayak Borneo (in Indonesian). 2 April 2014. ^ "Kerajaan Nan Sarunai". Melayu Online (in Indonesian). Archived from the original on 2 May 2018. Retrieved 28 December 2018. ^ "Iban Migration – Peturun Iban". Iban Cultural Heritage. 26 March 2007. Retrieved 3 December 2016. ^ "The Orang Kaya Pemancha Dana "Bayang" of Padeh". Ibanology. 27 June 2013. Retrieved 3 December 2016. ^ a b "Iban Heroes". Iban Customs & Traditions. 8 June 2009. Retrieved 3 December 2016. ^ Heimannov, Judith M. (9 November 2007). "'Guests' can succeed where occupiers fail". The New York Times. Retrieved 3 December 2016. ^ Avé, J. B. (1972). "Kalimantan Dyaks". In LeBar, Frank M. (ed.). Ethnic Groups of Insular Southeast Asia, Volume 1: Indonesia, Andaman Islands, and Madagascar. New Haven: Human Relations Area Files Press. pp. 185–187. ISBN 978-0-87536-403-2. ^ Adelaar, K. Alexander (1995). Bellwood, Peter; Fox. James J.; Tryon, Darrell (eds.). "Borneo as a cross-roads for comparative Austronesian linguistics" (PDF). The Austronesians: Historical and Comparative Perspectives (online ed.). Canberra, Australia: Department of Anthropology, The Australian National University: 81–102. ISBN 1-920942-85-8. Archived from the original (PDF) on 29 June 2014. Retrieved 29 June 2014. ^ a b "Origin of Adat Iban: Part 3". Iban Cultural Heritage. 12 June 2006. Retrieved 3 December 2016. ^ "Origin of Adat Iban: Part 4". Iban Cultural Heritage. 12 June 2006. Retrieved 3 December 2016. ^ "Tradisi Kurban Manusia Di Nusantara". Ibanology (in Indonesian). 23 June 2013. Retrieved 3 December 2016. ^ "Panglima Mujah "Buah Raya"". Ibanology (in Indonesian). 12 June 2013. Retrieved 3 December 2016. ^ "Jerita Penyarut Batang Ai". Iban Cultural Heritage (in Indonesian). 27 June 2006. Retrieved 3 December 2016. ^ "The Sampit conflict - Chronology of violence in Central Kalimantan". Discover Indonesia Online. Retrieved 3 December 2016. ^ "Tradisi Kurban Manusia Di Nusantara (Part 2 : Sulawesi)" [Human Sacrifice tradition in the Archipelago (Part 2 : Sulawesi)]. Ibanology (in Indonesian). 23 June 2013. Retrieved 3 December 2016. ^ "Tradisi Kurban Manusia Di Nusantara (Part 3 : Sumatra)" [Human Sacrifice tradition in the Archipelago (Part 3 : Sumatra)]. Ibanology (in Indonesian). 23 June 2013. Retrieved 3 December 2016. ^ "A Native of Borneo". The Wesleyan Juvenile Offering: A Miscellany of Missionary Information for Young Persons. Wesleyan Missionary Society. X: 60. June 1853. Retrieved 29 February 2016. ^ Baier, Martin (2007). "The Development of the Hindu Kaharingan Religion: A New Dayak Religion in Central Kalimantan". Anthropos. 102 (2): 566–570. ISSN 0257-9774. ^ "Perham's Sea Dyak Gods – Part I". Ibanology. 18 May 2013. Retrieved 3 December 2016. ^ "7 Iban gods from Raja Chenanum". Ibanology. 21 April 2013. Retrieved 3 December 2016. ^ "Part 2: Iban augury". Iban Cultural Heritage. 27 April 2008. Retrieved 3 December 2016. ^ "Nenung Atau Babi". Ibanology (in Indonesian). 11 June 2013. Retrieved 3 December 2016. ^ "The Origin Of Iban Omen Bird". Iban Cultural Heritage. 3 July 2006. Retrieved 3 December 2016. ^ Anggat, Stephen (3 April 2008). "The Iban Longhouse". Iban Cultural Heritage. Retrieved 3 December 2016. ^ "Leka piring Iban alu tuju ia". Ibanology (in Indonesian). 15 March 2013. Retrieved 3 December 2016. ^ "Ibanology ‹ Log In". Ibanology. Retrieved 3 December 2016. ^ Avé, Jan B.; King, Victor T. (1986). 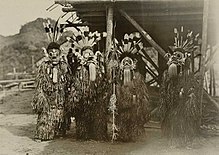 The People of the Weeping Forest: Tradition and Change in Borneo. Leiden, Netherlands: National Museum of Ethnology. ISBN 978-9-07131-028-7. ^ Sutlive, Vinson; Sutlive, Joanne, eds. (2001). The Encyclopaedia of Iban Studies: Iban History, Society, and Culture Volume II (H-N). Kuching: The Tun Jugah Foundation. p. 697. ISBN 978-9-83405-130-3. ^ "Part 1: Iban Adat Law and Custom". Iban Cultural Heritage. 22 April 2008. Retrieved 3 December 2016. ^ "Bengkel Tukang Parang Sibu Sarawak". parangjohnny.blogspot.com (in Indonesian). Retrieved 3 December 2016. ^ "Gagong perengka ke beguna ba bansa Iban". Ibanology (in Indonesian). 12 June 2013. Retrieved 3 December 2016. ^ "Pengaroh dalam budaya Iban". Ibanology (in Indonesian). 29 May 2013. Retrieved 3 December 2016. ^ "Iban Tattoos". Jędrzej's Borneo Blog. 20 March 2009. Retrieved 3 December 2016. ^ "Iban Traditional Clothing And Attire". Iban Customs & Traditions. 7 June 2009. Retrieved 3 December 2016. ^ "Restoring Panggau Libau: a reassessment of engkeramba' in Saribas Iban ritual textiles (pua' kumbu')". Ibanology. 23 April 2013. Retrieved 3 December 2016. ^ "Types of tajau". Ibanology. 30 May 2013. Retrieved 3 December 2016. ^ "Iban Customary Law for Tebalu (Widow and Widower)". Ibanology. 1 March 2013. Retrieved 3 December 2016. ^ "Kayau Indu and Iban women social status (Ranking)". Ibanology. 28 February 2013. Retrieved 3 December 2016. ^ "Iban Trackers". Ibanology. 3 June 2013. Retrieved 3 December 2016. ^ "Iban Heroes Part 2". Iban Customs & Traditions. 21 January 2013. Retrieved 3 December 2016. ^ "Blog Sejarah STPM Baharu: Semekar Cintaku : Pahlawan Hebat Iban Trackers: Awang Raweng". semekarcintaku.blogspot.com (in Indonesian). Retrieved 3 December 2016. ^ Abdullah, Robert Rizal (3 November 2010). "Brig Gen Stephen Mundaw - the first Iban General". PGB Warrior. Retrieved 3 December 2016. ^ a b Davidson, Jamie S. (August 2003). ""Primitive" Politics: The Rise and Fall of the Dayak Unity Party in West Kalimantan, Indonesia" (PDF). Asia Research Institute, National University of Singapore. Archived from the original (PDF) on 18 May 2014. ^ M., Fearnside, Philip (1997). "Transmigration in Indonesia: Lessons from Its Environmental and Social Impacts". Environmental Management. Springer-Verlag New York Inc. 21 (4): 553–570. doi:10.1007/s002679900049. Retrieved 3 December 2016. ^ Braithwaite, John; Braithwaite, Valerie; Cookson, Michael; Dunn, Leah (2010). Anomie and Violence: Non-truth and Reconciliation in Indonesian Peacebuilding. ANU E Press. p. 294. ISBN 978-1-921666-23-0. Retrieved 15 December 2011. In 1967, Dayaks had expelled Chinese from the interior of West Kalimantan. In this Chinese ethnic cleansing, Dayaks were co-opted by the military who wanted to remove those Chinese from the interior who they believed were supporting communists. The most certain way to accomplish this was to drive all Chinese out of the interior of West Kalimantan. Perhaps 2,000-5,000 people were massacred (Davidson 2002:158) and probably a greater number died from the conditions in overcrowded refugee camps, including 1,500 Chinese children aged between one and eight who died of starvation in Pontianak camps (p. 173). The Chinese retreated permanently to the major towns ... the Chinese in West Kalimantan rarely resisted (though they had in nineteenth century conflict with the Dutch, and in 1914). Instead, they fled. One old Chinese man who fled to Pontianak in 1967 said that the Chinese did not even consider or discuss striking back at Dayaks as an option. This was because they were imbued with a philosophy of being a guest on other people's land with the intention of becoming a great trading diaspora. ^ Hedman, Eva-Lotta E. (2008). Conflict, Violence, and Displacement in Indonesia. SOSEA-45 Series (illustrated ed.). SEAP Publications. p. 63. ISBN 978-0-87727-745-3. Retrieved 15 December 2011. The role of indigenous Dayak leaders accounted for their "success." Regional officers and interested Dayak leaders helped to translate the virulent anti-Communist environment locally into an evident anti-Chinese sentiment. In the process, the rural Chinese were constructed as godless Communists complicit with members of the local Indonesian Communist Party ... In October 1967, the military, with the help of the former Dayak Governor Oevaang Oeray and his Lasykar Pangsuma (Pangsuma Militia) instigated and facilitated a Dayak-led slaughter of ethnic Chinese. Over the next three months, thousands were killed and roughly 75,000 more fled Sambas and northern Pontianak districts to coastal urban centers like Pontianak City and Singkawang to be sheltered in refugee and "detainment" camps. By expelling the "community" Chinese, Oeray and his gang ... intended to ingratiate themselves with Suharto's new regime. ^ Linder, Dianne (November 1997). "ICE Case 11: Ethnic Conflict in Kalimantan". Inventory of Conflict and Environment. Archived from the original on 18 December 2016. Retrieved 3 December 2016. ^ Chin, James. "Sarawak's 1987 and 1991 State Elections: An Analysis of the Ethnic Vote" (PDF). Borneo Research Bulletin. Borneo Research Council. 26: 3–24. 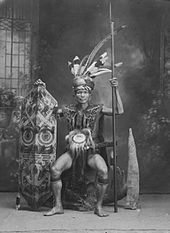 Wikimedia Commons has media related to Dayak people.